Communist Party of India's candidate Mr Kumar, who will make a political debut in April-May elections, will take on Giriraj Singh, BJP's candidate in Bihar's Begusarai. 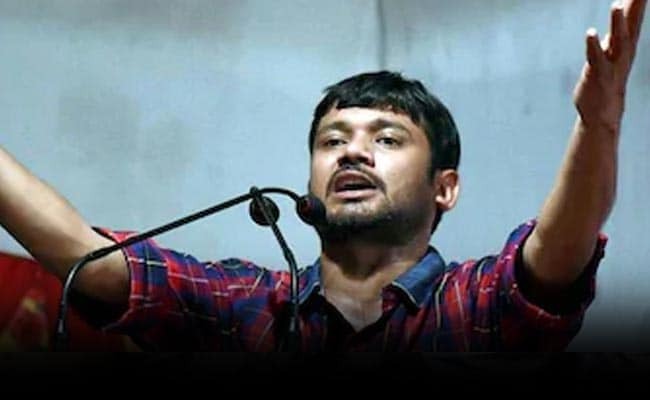 Kanhaiya Kumar said "the Minister has already said Vanakkam to Begusarai"
Student leader Kanhaiya Kumar on Monday took a potshot at Union Minister Giriraj Singh soon after the BJP leader said he was upset over his party's decision to field him from Begusarai. Kanhaiya Kumar, who makes a political debut in national elections, is Communist Party Of India's candidate in Bihar's Begusarai. The BJP Minister, who is the sitting lawmaker from Nawada, has expressed his displeasure with the party's decision of fielding him from Begusarai and not Nawada. He said his "self-respect was hurt" as no other sitting parliamentarian's seat was changed, except his. "My self respect is hurt that no other MP's seat was changed in Bihar. It was decided without talking to me. State BJP leadership should tell me why was it done. I've nothing against Begusarai but I can't compromise with my self-respect," he was quoted as saying by news agency ANI. The BJP has given the Nawada seat to its ally - the Lok Janshakti Party. Responding to the Union Minister's remark, Mr Kumar, in a Facebook post, said: "Pakistan tour and travels department's visa minister who often forces people to go to the neighbour country has been hurt over being transferred from Nawada to Begusarai. The Minister has already said: Vanakkam to Begusarai." The BJP Minister has used the Pakistan jibe on several other instances to attack his rivals. In 2014, soon after PM's victory, he had said: "those opposed to Narendra Modi should go to Pakistan." Earlier this month, Mr Singh said that those who don't attend Prime Minister Narendra Modi's March 3 rally in Patna would prove they are "anti-national" and they support Pakistan. He, however, had to miss the event later due to ill health. Mr Kumar, the ex-president of the student union of Delhi's Jawaharlal Nehru University, also made a reference to PM's "Vanakkam" remark, which the opposition said, he used to dodge a question while interacting with BJP workers in January. Mr Kumar, in his post in Hindi, indicated that the BJP leader, Mr Singh, did not want to wish to contest from Begusarai. The national elections begin April 11 and Bihar votes in seven phases on April 11, April 18, April 23, April 29, May 6, May 12, and May 19.